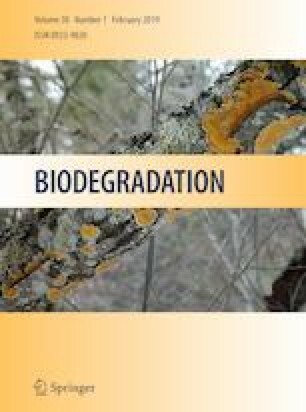 Biodegradation of 3,5,6-trichloro-2-pyridinol (TCP) in drylands is an important biological process of detoxification. Flooding in drylands can result in the formation of anaerobic habitats. However, little is known about the microbial metabolism of TCP in dryland soil under anaerobic conditions. Here, chlorpyrifos-contaminated dryland soil was incubated to enrich the TCP-degrading microbial consortium under anaerobic conditions. Chloridion and CO2 were released with TCP degradation, and the enrichment cultures of dryland soil could metabolize 97% of TCP (100 mg/L) within 20 h. Both reductive and hydrolysis dechlorination mechanisms were involved in TCP biodegradation under anaerobic conditions. Bacterial taxonomic analysis revealed that the aerobic TCP-degrading bacteria Ochrobactrum and dechlorination bacteria Delftia were the dominant genera. Anaerobic and facultative bacteria; i.e., Bacteroides, Bacillus, and Cupriavidus had lower relative abundances, but they were significantly enriched following treatment with TCP. These results indicate that the enrichment cultures of dryland soil dominated by aerobic bacteria could dechlorinate and degrade TCP under anaerobic conditions. This study was supported by the National Natural Science Foundation of China (Grant Nos. 41401288 and 41501251), Science and Technology and Culture Innovation Fund (Grant Nos. 26312160910 and 26312170904) for College Students of Liaocheng University and the Shandong Provincial Natural Science Foundation of China (ZR2018BH043).